Why do we like the Outlook client in Microsoft Dynamics 365? The Outlook client eliminates the need to navigate and log into additional programs to access Microsoft Dynamics 365. 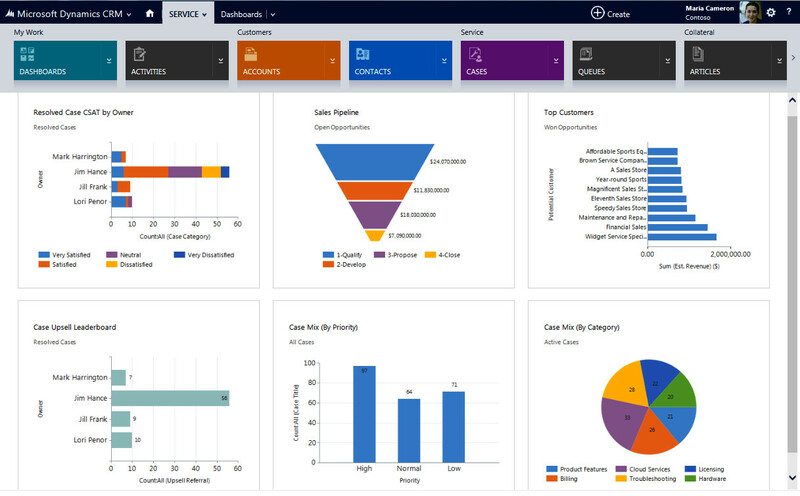 You have full Dynamics 365 functionality and data, plus additional features. This saves a significant amount of time by eliminating the manual process of re-entering data. The Outlook client allows you to track emails, tasks, appointments and contacts that are already created in Outlook to Dynamics 365. And you can attach Dynamics 365 sales literature and Knowledge Base articles directly to emails sent through Outlook. Q: How is the layout different than the web client? A: The Dynamics 365 for Outlook client can be navigated through a folder structure, similar to the Outlook inbox. Q: How can I access commonly used functions quickly? A: The Outlook client provides a quick access toolbar which allows the end user to pin commonly used functionality directly to the Outlook search bar. Q: Can I choose what items are synced automatically? A: The Outlook client provides access to the users Personal Options in Dynamics 365, allowing the user to set what activities should sync to Dynamics 365 automatically. Q: I need to use the Outlook client, but I do not have internet access. What can I do? A: You can use Microsoft Dynamics 365 for Outlook to access your Dynamics 365 data when you’re on the go. This is perfect for users that travel and do not always have access to internet while working. While offline the Outlook client copies a subset of data to your computer’s Hard Drive. Q: What do I need to know before I start troubleshooting? A: Settings in Internet Explorer directly affect the Outlook client. Issues affecting the web client will also affect the Outlook client. Errors directly related to Outlook can be seen on the Local Machine within the Event Viewer. Microsoft provides a local Tracing tool for the Dynamics 365 for Outlook add-on. Q: What settings in Internet Explorer should I update? A: The Outlook client is directly linked to Internet Explorer settings and cached files. The first step of troubleshooting the Dynamics 365 Outlook client should always be to clear your internet cache in Internet Explorer and to add your organization URL to your trusted sites and the Compatibility View Settings. This is necessary even if you never use IE when accessing the web client. Q: Are there any settings on my computer I can check? A: The credential manager will often store usernames and passwords related to the Dynamics 365 web client. If you are a user that accesses multiple environments, this can create conflicts with the Outlook client. It is a best practice to NOT store these usernames and passwords in the credential manager if prompted, and all usernames and passwords related to Microsoft Dynamics should be cleared out when you begin troubleshooting. Q: What can I do to gather more information for my support team? A: Use Microsoft’s tracing tool provided with the client to gather additional information for your support staff. The tool can be found in the Diagnostics tool in the Dynamics 365 for Outlook install folder. Always make sure to turn off tracing after gathering the logs. If you are interested in evaluating Microsoft Dynamics 365 for Outlook contact us today. HOW ABOUT AN AFTERNOON POLITICAL CARTOON? Microsoft Office 365 offers a suite of productivity tools, fully integrated to Microsoft Dynamics 365 Customer Engagement. Well-known applications like Outlook, Excel, SharePoint and OneNote are complemented with a set of cloud-based tools that improve collaboration, communication and productivity in the workplace. At JOVACO Solutions, we love the mobility and accessibility offered by this integration, and make use of it in our daily processes. Our teams work daily with SharePoint to share documents and resources from a common portal. This improves collaboration and teamwork, while also reducing delays as everyone can work simultaneously on a given Word document. When a document linking to an opportunity or service request is created, it automatically creates a new path, making it easy to retrace your path within a client account. We also make use of OneNote, a digital notebook that lets you take notes, highlight items, record voice memos, add files, and even draw. Notebooks can be linked to entities such as accounts, opportunities and cases, and can then be accessed by all involved team members so that they can add their own notes, improving collaboration and visibility. You can edit CRM views and lists in just a few clicks, thanks to the integration to Excel Online. Make your changes, press save, and the modifications are immediately reflected in Dynamics 365. For more advanced data manipulations, you can easily import the information, modify it in Excel, then reimport it to the CRM. Our sales team also loves the integration to Outlook. Client information can be accessed and updated directly from Outlook without having to switch between applications. Emails can be linked to the relevant account for quick reference later, and subsequent emails will also be automatically tracked in Dynamics 365. The integration to Word also lets us access templates to quickly generate quotes, proposals and statements of work. This makes document generation a lot faster and ensures that branding and content is standardized across all documents that are sent out from our company. These are just a few ways that the integration between Office 365 and Dynamics 365 Customer Engagement allows us to increase productivity, improve access and mobility, as well as promote collaboration and teamwork. As the applications are always up to date thanks to the cloud, adopting Office 365 within your organization also means reducing infrastructure and maintenance costs, while putting a suite of proven and robust applications at your employees’ disposal. Your staff members are likely already familiar with these tools, ensuring a high user adoption rate. SuiteWorld isn’t your average conference…It’s a full-blown extravaganza filled with opportunities to grow, network, learning and more! But putting that into writing really doesn’t do it justice. Thus, on this episode of “The NetSuite Podcast,” SuiteWorld creator, Jennifer Smith, (yes, she came up with the whole idea!) and the current, fearless leader of SuiteWorld, Laine Sobel, come on to discuss everything you need to know about the No. 1 cloud ERP event of the year. Smith and Sobel dive into the history of SuiteWorld—including its genesis and convincing NetSuite founder Evan Goldberg it was a good idea—how the event has transformed over the years, and what we can expect at SuiteWorld19. They explain how attendees from all parts of the world gather to hear inspirational success stories from companies just like theirs and get equipped with strategies to deal with industry-specific challenges. You also get the opportunity to network with more than 7,250 business leaders and explore an ecosystem of more than 125 NetSuite partners. Smith and Sobel even drop some very exciting announcements, including details about this year’s keynotes and a few new ideas that are coming to fruition for the first time ever. You won’t want to miss this episode, so be sure to tune in on Apple Podcasts, SoundCloud and YouTube. SuiteWorld19 is in Las Vegas from April 1 – April 4. If you haven’t registered for SuiteWorld19 yet, click here. With so many prospects and customers relying on email to receive information about promotions, deals, events, and news to their inbox, companies are working harder than ever to build large email lists — but gathering valuable contact information is only half the battle. Spam complaints, undelivered messages, and unsubscribes can all impact email deliverability, as Internet Service Providers (ISPs), Email Service Providers (ESPs), anti-spam advocates, and email protection services set thresholds for bounced emails, spam complaints, and unsubscribe requests. If your email marketing efforts are consistently being sent to invalid or unwanted email addresses, your messages are likely being filtered as spam, and your account is probably frequently being blocked. To ensure your messages reach their intended destination (the inbox), maintaining proper email hygiene is critical. Keep reading to learn more about email bounce backs and what measures you can take to set up your organization for email deliverability success. An email bounce occurs when an email is rejected by the recipient’s mail server. Upon rejection, the sender receives a notification that their email has not been delivered — or that it has “bounced” back. If an address continues to result in a soft bounce after several attempts in a 72-hour period, the address should be listed as unsafe for sending. A high percentage of emails expire each year because people either switch their address or update their account. It’s also common for customers to provide fake email addresses out of privacy concerns. Invalid addresses on your email list can severely damage your brand. Even if invalid addresses constitute only 10% of your email list, there’s a good chance that only about 44% of your emails will get delivered if you’re not using an email validation service. The potential consequences of a high bounce rate as a result of failing to validate email addresses are wide-ranging. You may get labeled as a spammer, ensuring that very few of your customers ever actually see your messages (and even fewer bother to read them). High bounce rates can also hinder your brand’s reputation. Some email service providers even ban clients with high bounce rates simply because they failed to validate their email addresses. Bottom line: you need a reliable way to validate email addresses to help you avoid the consequences of a high bounce rate and ensure you’re reaching your customers with the right messaging at the right time — affordably, efficiently, and accurately. When looking for a way to validate email addresses, focus your effort solely on services that include the features your business needs to succeed. For small businesses, this could be single-email address validation. For enterprises, bulk email verification is likely a better fit. Although the email industry used to view hygiene vendors in a negative light because they made it appear senders were getting bad data, practicing good email hygiene habits is now considered a crucial element toward improving email deliverability. To ensure quality email hygiene for our customers, Act-On currently partners with NeverBounce. This email verification and list cleaning service use a proprietary 20+ step verification process to check each email up to 75 times from different locations around the globe. Utilizing MX, DNS, SMTP, SOCIAL, and additional private technologies in determining the validity of addresses, NeverBounce guarantees that no more than 3 percent of valid emails will bounce after using their service. NeverBounce also offers free deduplication and bad syntax removal prior to cleaning to ensure error-free email lists. Preventing bounce backs and ensuring quality data usage are just two necessary components of ensuring your emails are consistently delivered to the inbox. Check out our Deliverability 101 series to learn how your organization can prepare for (and achieve) email marketing success. Reinforcement learning — a machine learning training technique that uses rewards to drive AI agents toward certain goals — is a reliable means of improving said agents’ decision-making, given plenty of compute, data, and time. But it’s not always practical; model-free approaches, which aim to get agents to directly predict actions from observations about their world, can take weeks of training. Model-based reinforcement learning is a viable alternative — it has agents come up with a general model of their environment they can use to plan ahead. But in order to accurately forecast actions in unfamiliar surroundings, those agents have to formulate rules from experience. Toward that end, Google in collaboration with DeepMind today introduced the Deep Planning Network (PlaNet) agent, which learns a world model from image inputs and leverages it for planning. It’s able to solve a variety of image-based tasks with up to 5,000 percent the data efficiency, Google says, while maintaining competitiveness with advanced model-free agents. As Danijar Hafner, a coauthor of the academic paper describing PlaNet’s architecture and a student researcher at Google AI, explains, PlaNet works by learning dynamics models given image inputs, and plans with those models to gather new experience. It specifically leverages a latent dynamics model — a model that predicts the latent state forward, and which produces an image and reward at each step from the corresponding latent state — to gain an understanding of abstract representations such as the velocities of objects. The PlaNet agent learns through this predictive image generation, and it plans quickly; in the compact latent state space, it only needs to project future rewards, not images, to evaluate an action sequence. Above: PlaNet learning tasks in a simulated environment. Hafner and coauthors believe that scaling up the processing power could produce an even more robust model. One of the problems of the Second Artificial Intelligence (AI) Winter (1987-1993) was that there was not enough data to go around. We did not yet understand the value of “Big Data,” and academia was working on models fueled by “Small Data.” However, now we have entered the era of “Bigger Data Than We Ever Imagined.” We are producing data on the order of exabytes. It is predicted that by 2020 we will use zettabytes. By 2024, yottabytes are in sight. Hyperscalers are frantically expanding their clouds to meet the demands of the 21st century, and the whole planet will become one giant hard disk attached to, hopefully, a capable calculator. Exascalers, on the other hand, are concerned with “Fast Data”, the application of big data analytics to smaller data sets in near-real-time. They are racing beyond the petaflop to reach exaflop speed by 2021. Both Big Data and Fast Data have already drastically reconfigured the landscape of the Financial Times Global companies by market cap. In 2009, there were no information technology companies in the FT Global 500 top 5. However, a mere nine years later, all companies in the FT Global were information technology companies, which took over from big energy. Most importantly, all of these companies are in the process of pivoting towards AI. One of them is Tencent, the first Chinese information technology company to enter the top 5 (admittedly, this only happened for Q1. The company later lost its position after its earnings call in Q2). However, a new data inflection point is coming, and it will be driven and influenced by the pressing need in healthcare. 2018’s FT Global top 5 has undoubtedly posed two questions: Which industries provide the most data, and which ones need the most speed? They all arrived at the same conclusion: medical and life sciences. Because in medicine and life sciences, there are power laws at work that dwarf Moore’s Law. In the USA, health data doubles every 73 days, estimated to arrive at a hefty 2.3 zettabytes by 2020. This is a hockey stick scenario that the information technology companies cannot afford to miss. The 3 Super-A’s (Amazon, Alphabet, and Apple) all announced a ground-breaking restructuring of their divisions and far-reaching collaborations (ABC-Amazon, Berkshire, Chase) to jump on the “big and fast data” bandwagon. This could produce surprising ripples in which companies hit the top of the FT’s Global 500 list in the near future. By 2020, some of the information technology companies won’t be information technology anymore but Life Technology companies, pointing their search and intelligence engines towards healthcare and life science. This poses a legitimate challenge to the current biopharmaceutical and healthcare companies with their dwindling intellectual property assets and lackluster efficiency of discovery. Interestingly, by Q3 of 2018, Facebook lost its spot to Berkshire Hathaway, a well-known investment company focused on reinsurance of the healthcare and life insurance industry. It is entirely possible that, by 2025, most of these companies that merge technology and healthcare could be mandated by antitrust laws to break up into information technology and life technology corporations. However, the confluence of big and fast will also turn the tables and disrupt who owns what. Today, big and fast data lies in the hands of the privileged few, many in the top 5 or top 10 of the FT Global. However, in 2025, we will be living in a drastically different world from the one we live in today, and individuals will own their own information, in healthcare or otherwise. The first generation that will thoroughly enjoy their personal privileges of Life Data will be Generation Beta (2025 to 2039). These will be the children of Generation Z (with Z we will have exhausted the Latin alphabet and returned to the Greek). All information, coupled with accessible calculators, will belong to its rightful owner, who will be free to do with it whatever they want: move it, sell it, share it, donate it, add to it, maintain it, remix it, delete it and create it again. New personal devices will be designed to collect, store, encrypt, and manage personal and structured medical data on an opt-in basis. As a result, users themselves will have become “the edge” and consider themselves nodes. All medical data will be sequenced by then. Hence, all medical information will be encrypted and governed by a “smart contract” – contracts as computer code — that will stipulate when and by whom it can be accessed. New economies will be born, and medical information will become an alternative financial asset, with individuals receiving dividends on their data and due monetary benefit for participation in massive clinical trials and prospective health studies. Individuals will not be passive donors of their information but will be incentivized to be more engaged participants in research, potentially in a planetary medical data project. Medicine will finally break out of its silos. Individuals will have the choice between “portfolio managers” who will represent the data of their clients to potential patient recruiters in return for a real-time dividend. Individuals will be kept updated ubiquitously with research on their condition. Algorithms — fast data — will continuously monitor new and upcoming trials tailored for the individual, consisting of cohorts with common diagnostics, genetics, environment, family history, and predicted clinical trajectories. The confluence of this data will finally make research understandable to individuals and elusive etiologies less obtuse and accessible. Gen B will be born in an always-on world with quantum computing algorithms and their own AIs that harness the advances of big and fast data. Everything around them will be autonomous and smart. They will have edited genomes that will make them no longer our descendants but ancestors in their own right, ready to become the first space-faring civilization. Walter De Brouwer is cofounder and CEO of doc.ai. He is a Belgian-born technology entrepreneur with over 27 years of experience, a Fellow of the Royal Society of Arts, and served as President of RSA Europe from 2006 to 2008. He is a member of TED, curator of TEDxBrussels, and was a distinguished lecturer at the National Science Foundation in 2013. His article, “How the People Are Taking Over the World,” was among Techonomy’s Most-Read Articles of 2014 and was cited by its editors as “perhaps the most philosophical of Techonomy’s top articles” that year. Prior to doc.ai, he was Founder and CEO of Scanadu Inc., a $ 57 million venture-backed mobile health company. 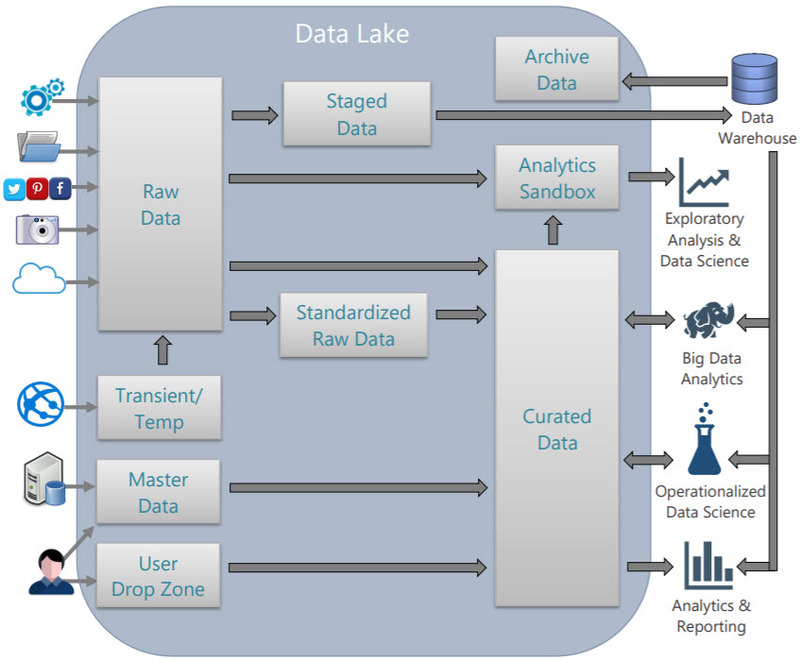 This post covers several things I’ve heard or been asked recently about organizing data in a data lake. Also notice in the above example how the date element is repeated in *both* the folder structure and the file name. Being very clear in the naming of folders and files helps a lot with usability. Q: How do data lake zones translate to a folder structure? Generally speaking, business users only get access to the prepared data in the curated data zone (with some exceptions of course). Zones like Raw Data and Staged Data are frequently ‘kitchen areas’ that have little to no user access. That’s why putting the zones at the top-most level is very common. However, if your objective is to make all of the data available in an easier way, then putting zones underneath a subject area might make sense—this is less common from what I’ve seen though because exposing too much data to business users can be confusing. If your objective is to have an enterprise-wise data lake, then more separation is less appealing. Q: Should the date reflected in the folder structure be the ingestion date or the date associated with the source data? It could be either one. I tend to think this is dependent on whether you’re dealing with data that’s being pushed or pulled into the data lake, and if it’s transactional or snapshot data. Push system: Let’s say you have machine telemetry or IoT data that is being loaded to the data lake. In this case, the dates in the folder structure would typically be based on ingestion date. Transactional data: If sales data is being loaded, the dates could easily relate to the sale transaction date (even if we pulled the data out three days later). Typically transactional data is append-only. Snapshot data: Let’s say we want to organize the data by its “as of” date. If you look back at the very first image shown above, the CustomerContacts folder is intended to show a snapshot of what that data looked like as of a point in time. Typically this would be for reference data, and is stored in full every time it’s extracted into the data lake. Q: Is it a good idea to created folders which nest multiple data elements? Security: Setting up security is probably harder. For instance, if Mary should see everything in Division 2, that just got harder because now Division is associated with the granularity of Projects. Not impossible to manage, just likely to be more work. Q: If I need a separate dev, test, prod environment, how would this usually be handled? Usually separate environments are handled with separate services. For instance, in Azure, that would be 3 separate Azure Data Lake Storage resources (which might be in the same subscription or different subscriptions). We wouldn’t usually separate out dev/test/prod with a folder structure in the same data lake. It can be done (just like you could use the same database with a different schema for dev/test/prod) but it’s not the typical recommended way of handling the separation. We prefer having the exact same folder structure across all 3 environments. If you must get by with it being within one data lake (one service), then the environment should be the top level node. Q: How much do I need to be concerned with the similarity of file contents within a folder? Q: When should we load data from a relational data source into a data lake? I devoted a blog post to this because it comes up a lot—check here. Q: Data lakes are supposed to be agile. So I don’t need to worry about about naming conventions, right? Try your best to not neglect naming conventions. You might use camel case, or you might just go with all lower case – either is ok, as long as you’re consistent. There are two big reasons for this: First, some languages are case-sensitive so consistent naming structures end up being less frustrating. Second, the bigger your data lake gets the more likely you are to have scripts that manage the data and/or the metadata, and they are more easily maintained and parameterized if consistent.